Welcome to our fun free Poker site that lets you play live Texas Holdem Poker against other players without money or credit cards. We offer Texas Holdem players no money online practice games so they can play for fun, and our experience and strategies since 1999. The game of Poker is an extremely popular and widely known card game ever since it was invented. It lets players use strategy, analysis, and a little bit of luck to bet your hand while playing. This website is full of knowledge available to online Poker players of all kinds, and is a great source of information such as rules and stats on anything related to the world of card games. We provide expertise and reviews of online poker sites, games, and more card game strategy and site tips. We also provide an up to date blog that has the latest news and tournament info. Playing a free game of Poker isn’t our only focus here, as we also provide schedules and tips. We show upcoming tournaments in Las Vegas, as well as from around the world, and can find the latest schedules and tours. There is also a great section on how to make the most out of this card game. 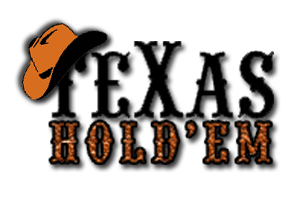 Play our free casino game version of Texas Holdem. The game is very similar to Multiplayer live Texas Holdem, but here you play poker against the casino. You are the only player and play against the casino versus against other players. No money is involved, no credit cards, this game is freely played for fun. This Flash poker game was provided by Bovada Poker Room. If you are new to Casino Holdem, you can learn all about the game at our Casino Holdem Rules page. This glossary will help out any new player that needs to learn the language used as they play poker, whether it is online or in a live tournament. Each term will be defined, as to help you better understand what other players, the dealer, and the general rules of the game are, as it will be imperative to know if you want to win. Familiarize yourself with all of these terms, as they will appear frequently while playing, even if you are just observing a game. The following terms and definitions are the most commonly used and found when playing poker, so be sure to check them all out, even if you know most of them, there may be some that you don't know. When a player bets all of his remaining chips/money. Other players can continue to bet, which will be placed into a side-pot. In the instance the player wins, he will only take the pot in which he had his chips. A small part of a bet that is contributed by each player placed into the initial pot of a poker hand. Most poker games use "blinds" to get initial money in the pot. When a player that is favored to win is beaten by the underdog hand, usually due to getting the winning hand with the help of the River card. Term used when the underdog won by wild luck. The amount of money a player has to bet with. The first chips placed into the pot during a round. The larger of the two blind bets. It is the first full bet placed during a round. A card that is dealt that does not affect the standings of a hand. When a player, who doesn't have a good hand, bets as if they had an excellent hand; essentially lying in order to beat out the other players. All of the cards placed on the table during a community card game, like Texas Hold'Em. This includes the Flop, Turn, and River cards. A white disc that determines which player is considered the dealer. The amount of money a player pays to get chips and participate in a game or tournament. Putting the amount of money equal to the most recent bet or raise into the pot. A player that almost always Calls, very rarely folding, and only raising when they have a great hand. A poker game that uses real money instead of chips. Not making a bet, with the option of 1) continuing in the round, 2) being able to call, or 3) being able to raise later on in the round. Small, round piece of plastic that represents a monetary value used in place of cash. 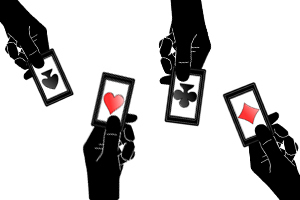 Cards that are placed in the middle of the table, which can be used by all players to create their hand; there are 5 cards in total. 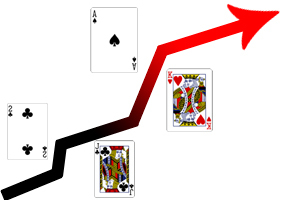 A Hold'Em hand whose two initial cards are one unit apart in rank. Ex: K-Q, 8-9. The player that actually or theoretically deals the cards. In Casinos/Tournaments or Online, it is necessary to determine which player would be dealing the cards, by using the Button. In order to determine which players are the Blinds, and the order of betting. When playing online poker, some tables offer protection if a player were to suddenly disconnect from their game due to connectivity issues, etc. In this case, the players hand would be considered All-In and if it wins, the player would get the pot. A hand that will usually always lose to a better hand that is usually played. Ex: a K-3 will almost always lose to a K-Q. Playing a hand that is not considered good, in hopes of receiving the right cards. The three seats to the left of the Blinds. The amount a player expect to win on average based on certain plays. A player that has the best hand, statistically, to win the pot. The first three cards placed on the board in a community card game. Five cards of the same suit. It beats a Straight and loses to a Full House. To forfeit from a round of poker, usually done when a player has a poor hand. Four cards of the same value. Ex: 4-4-4-4-9. A Turn or River card in which a player did not have to bet on due to previous plays. When a player has the possibility of getting a Straight, but is missing one card to do so. A pot that is contested by only two players. The cards dealt face-down to a player, which can be used only by them. An unpaired hand that is used to determine the winner between two hands that are almost equal in value. A player that plays on a lot of starting hands. A player that overly and aggressively raises, bets, and bluffs. The pile of folded and burned cards that the dealer and/or players have discarded. A type of poker where the player can bet any amount of chips when it is their turn to bet. The best possible hand based on the board. The chances or likelihood that something happening. A Hold'Em hand where the two starting cards of different suits. A possible straight that can be completed from both ends. Ex: 5-6-7-8, with a possible 4 or 9. A card that will make your hand win. A card that is higher than any other card on the board. Poker rooms that allow players to play with fake money; free poker. The cards that only the player can use and see. The money or chips that have been bet during a round. A type of poker where the player can bet any amount up to the amount currently in the pot when it is their turn to bet. The round of betting that takes place before the Flop cards are placed on the board when playing Hold'Em or Omaha. 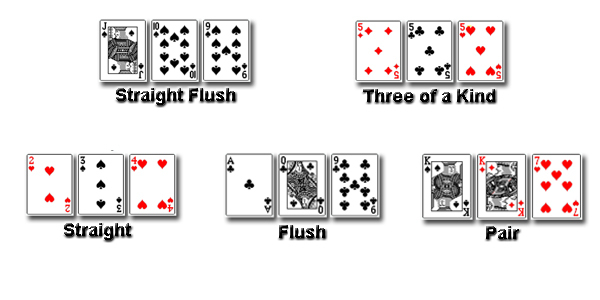 A flop that has three different suits, making it so that no flush can be made on the Turn. Increase the amount of the bet. An amount of money taken out of the pot as the cardroom's income. Usually a small percent of the pot during each round. When a player raises after an opponent has just raised. A regular poker game, and not a tournament; also uses money rather than chips. The fifth card that is placed on the board when playing Hold'Em. A way to describe a hand that was made by getting the correct cards on the Turn and River. A three of a kind when the player has two of the cards in his hand and the third is on the board. When the remaining players at the table turn their cards over in order to determine who has the best hand. Playing a strong hand in a weak manner in order to keep player in the game. The smaller of the two blinds, and is usually one-third or two-thirds of the first round bet. The amount of chips a player has on the table. Five cards in consecutive order. Ex: 3-4-5-6-7. Five cards that are in consecutive order, as well as being the same suit. Ex: 7-8-9-10-J of Clubs. The symbols that define the card. In poker, there are four general suits: Spades, Clubs, Diamonds, and Hearts. A Hold'Em starting hand that are the same suit. A hint that a player unknowingly does which can show the strength of his hand. Three cards of the same value. Ex. 7-7-7-2-10. A player that does not play many hands, waiting for strong hands to play, and usually fold early in the round. Large poker competition where players must Buy-In. All players start with the same amount of chips and will progressively knock-out the other players. The fourth card placed on the board. A player that has a hand that is not statistically favored to win the pot. This poker glossary will help beginners understand the language that is used when playing, whether they are in a live game or tournament, or online. Improving the way you play poker is always important. This is why these strategies will help you improve the way you play. This poker strategy are mainly for the newcomer that hasn’t had enough time to learn these through experience. This will help give your gameplay a boost, and get you on the fast track towards improving. Even if you are at home, playing online, it is always a golden rule to never drink too much alcohol when playing poker; even if it is free. Alcohol has a certain tendency to make even the best poker player into a reckless amateur. It will un-inhibit the way you play, which may let you think that your hand is better than it really is, or will allow you to take unnecessary risks. Most of the professional poker players make sure to not over drink, as they know keeping their mind free and focused is the way to win. You can always drink after taking everyone’s money. If you have a good, or even ok hand at the start of the round, and decide to stay in even when your hand has clearly become useless, that is the quickest way to lose all your money. Many players become stubborn after having placed a few bets, and decide to stay in regardless of how good or bad their hand is. It is never too late, simply fold your hand and you will undoubtedly have more chips than if you had stayed in. Some may think that if you fold often, and when you finally do play, the other players will know that you have a good hand. That is false, players that rely on what their opponents have will always lose, so you only need to focus on your hand; at least at the start of each round. Playing a bad hand just because you think it will improve when you get the community cards is not a good strategy. It is much better for you to start strong from the start. Bluffing is a great way to get some extra chips when you do it right, but there are times when it is best to not use such a risky strategy. Bluffing should only be used when very confident, and very rarely. Once a player has seen that you bluff often, you will never be able to bluff effectively again against that player. This is a secret weapon, emphasis on secret. You always have to keep an eye out on your money, as it is your life line when playing poker; no more money, no more playing. This is why it is important to make the right choices before playing. Pick the right table that has the right betting range that is appropriate for your bankroll. Don’t play at a $100/$200 table if all you have is $300. Pick the right table, and watch as you climb your way up to that high roller table. Also, never play with money that you cannot afford to lose. Don’t play with money that is necessary for you or your family’s survival. It isn’t good to play poker thinking you are going to lose, but don’t make the mistake of thinking that you will always win. Don’t get stuck playing just one type of poker. Many believe that Texas Hold’Em is the only way to go when playing poker, but that is just because it is the most popular at the moment. There are many different poker variants that offer you the same level of competition, entertainment, and winnings. Try playing Omaha or 5-Card Stud. Finding the type of poker game that you are good at will let you have fun while you win. There are two specific times when you should never play poker, when you are drunk and when you are emotional. By emotional I mean mad, sad, frustrated, or stressed out. Your mind works very differently when it is affected by emotions, as it clouds your judgment, allowing you to take and make the wrong decisions. If you are unable to control your emotions, do not play. You are simply replacing rational thoughts with emotional responses. You must always be focused on the table and the players sitting at that table. You must be aware of the cards being played, as well as what your opponent’s hands may be. This is important even when playing online, as it is easy to make mistakes when your attention is elsewhere. You may not be able to read your opponents as well while playing online, but you can always pick out small tells on the way they play after a couple rounds. If and when you have double as many chips as the other players, do not become that annoying player that bullies the rest into losing their ante at the start of each round by going all-in. That is the quickest way to become alienated and the game may even become boring to you after a while. I am not saying that you should never bully, just don’t do it to often during regular games; using it during a tournament is actually a good strategy. When a player has you beat, don’t place the call bet in order to see their hand; it is not worth it. If you already know they will win, don’t give them more of your chips, save them for revenge. This general poker strategy will help you become a better player, or if you already have plenty of experience playing poker, this may refresh your memory on some of the basic things to do and not to do while you play poker. There are 41 casinos to play poker in Las Vegas, anywhere from the Las Vegas Strip to Downtown. There are many different types of poker games, and many can be found within the same casino. There are casinos that offer a great variety, casinos that offer few options, and many in between. It is important to pick a great poker table. The better you play a game, the better odds you have of winning. We have gone to each poker table in the Las Vegas Strip and Downtown Vegas, and know which are the best and worst casinos Las Vegas can offer. The rooms tend to have more or fewer games, depending on the ante bet and popularity of the games. This isn't always the case, but it is a good rule to follow. The more money you bring to Las Vegas, the higher ante poker game you will be able to play. Player's that can afford the $200/$400 poker blinds, will be able to play at some high stakes tables. These areas are separated and isolated from the rest of the casino. Comp points can be earned quickly in these areas, and will offer additional perks for high stakes players. Players at these high stakes tables can enjoy a more competitive match, as well as higher payouts. There will be many different variants to pick from. There are many different games offered in Las Vegas, some that you can find using the poker games guide. Player's can pick whichever game they prefer, including those they are experts at. Game variants are offered throughout Vegas, including Bellagio, Caesars Palace, Mirage, Venitian, and the Wynn. Some games can be found at most casinos, while others are more rare to find. Poker Tables is a good guide to let players know which Vegas casinos are better equipped. A lot of the Poker Tables offer poker games that are more popular to play, along with a few that are not. Players looking for a good number of Poker Tables to play at can go to Bellagio, The Orleans, and Wynn. The casinos that offer more games will have more poker tables. Look for locations that have medium to high amount of Poker Tables, and you will find more games. You will also find few poker games all over Las Vegas. There are also games that involve a lot of poker players, and usually come with higher cash prizes, these are tournaments. Many of these poker tournaments can be found at most casinos, including Aria, Bally's, Golden Nugget, and Monte Carlo. You won't find poker tournaments at Hooters or Westgate on the Las Vegas Strip, which have few tables to play at. Other casinos that offer poker tournaments the Plaza, Red Rock, Treasure Island, and Venetian. When playing against other players in tournaments, remember that bluffing is a valid strategy to use, as opposed to playing online. Some casinos have more tables, as they offer more poker games to play. Check out each of the table rules before sitting down, as there will be different ante's and buy-ins. This will help you decide which poker table you prefer. When you start playing any of the poker game variants, there is one thing that every player must know, the poker card hands. These poker card hands, also commonly referred to as hand rankings, will help you understand what combination of cards will help you beat the other players. However, not all poker games are created equal, so there are some slight variations when it comes to the poker card hands. 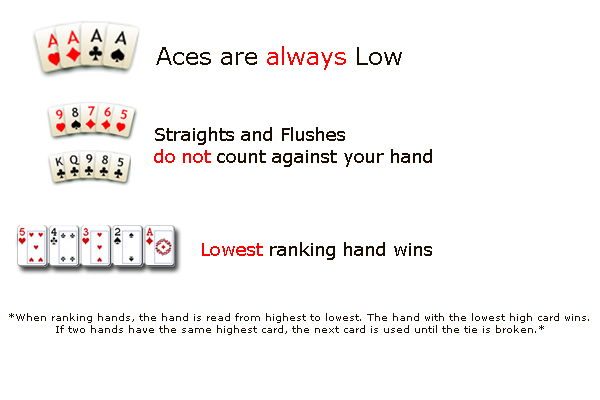 This specific hand ranking can only be used when you encounter three card poker variants, as the player will only play with a hand of three cards. Most other poker games use a five card hand. Video poker is quite simple, so if you understand the other hand rankings, this will be easy for you to play. There may be other poker games and variants out there, but these are the most popular ones being played currently. If there are others we have missed, just remember that each game, although changed slightly, will have very similar rules and hand rankings. So, understanding the basics will get you a long way in poker. 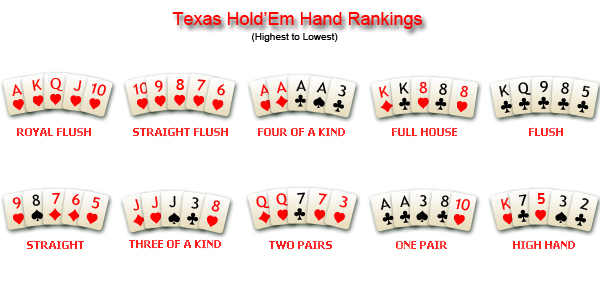 For more details on rankings of poker hands, read this article: Texas Holdem. Poker is one of the easiest card games to play, as it is very straight forward, with little to no confusing acts. When we talk about poker, we most often associate it with Texas Hold’Em; seeing as it is one of the most popular variants of poker being played currently. We will use the steps that Texas Hold’Em uses when playing, but don’t worry, if you want to play other poker variants like Omaha, the steps are exactly the same or have a slight variation that won’t really confuse you if you understand these steps. For the terms that you do not know or understand, check out the Poker Glossary for the descriptions and explanations of the common terms used in poker. Before you even start getting cards handed to you, there are a few table rules that you need to look out for when sitting down. You will usually see a fraction, $4/$8 or $100/$200. These are so that you know what the Small Blind (SB) and Big Blind (BB) are. Blinds are used instead of Antes, a forced bet that the players have to place before receiving any cards, only two people will have to bet per round. Small blind only bets half of the ante, or minimum starting bet, and the Big Blind will place the full minimum bet. Once the SB and BB have been placed, the dealer then hands out the cards. In Texas Hold’Em, you will only receive 2 cards to start off with, as the rest of the cards are community cards; they are cards that all players can use to make the 5-card combination. Each player looks at the two cards that they were dealt, and from there the first round of betting starts. Players go around, starting from the person to the right of the BB and either Check, Fold, or Raise. This goes around the table until it reaches the BB, where he can decide to Raise, Fold, or Check. If someone raises, all players are then asked again if they want to Call, Raise, or Fold. Once everyone has placed the exact amount into the pot, the next round can start. After the first round of betting, the dealer will then place three cards in the middle of the table. These three cards are called The Flop. After the three cards have been placed, another round of betting occurs. Depending on the two cards you have in front of you, you can decide to either Raise, Call, Check, or Fold. Once the entire table has had their turn, the next round begins. The dealer will now place one more card in the middle of the table, along with the three previously placed cards; this card is called The Turn. Now there are 4 community cards, and the two personal cards that each player has. Another round of betting will start, along with the same choices as before. The last card is then dealt by the dealer, making a total of 5 community cards. The last card dealt is called The River. This will be the last round for betting. Whichever players are still in the game at this point will take turns placing bets or checking. The last player to Call on a bet will have to show their cards to the other players. If this player is the round winner, the other players can choose to show their cards or keep them hidden (it is a good strategy to keep them hidden regardless of whether you were bluffing or had a good hand). Obviously, the round winner will take what amount of chips that are in the pot. You are no longer able to play once you run out of chips. Poker can be said to be 50% luck and 50% skill, so don’t forget to gain experience and skill as you play and learn. Play our Online Poker Game and improve your skills. This no-download game can be played on any Windows or Mac computer and on Android and iPhone mobiles and tablets.